The story behind Ken Pattersons photographic exhibit, “In the Footsteps of John Muir”, currently on show at Federal Hall, Wall Street, New York – through July 8th, 2016. As Patterson notes … “All of America’s national park system came out of this determination by Roosevelt to preserve America’s wild places for future generations. AT THE heart of world finance on Wall Street, Americans are lining up to pay tribute to the Scotsman they regard as a hero for changing their country for the better. Yet back in his homeland, the name of the man they regard as the father of modern environmentalism remains in relative obscurity. A photography exhibition is being held in Federal Hall, a historic building in the centre of the financial zone, ­celebrating the life and legacy of a man who measured riches in nature’s bounty, not stocks and shares. Muir was born in Dunbar, East Lothian , in 1838, crossing the Atlantic with his family 11 years later, landing in Wisconsin and growing up to become the father of the US National Park Service, who ­celebrate their ­centenary in August. Fifer Ken ­Paterson’s exhibition in Manhattan is one among many events planned to mark it. Ken’s show, In The ­Footsteps of John Muir, features the work of a ­Scottish ­photographer on whose life Muir had a profound and transformative impact many years after his death in 1914. Ken has had a lifelong enthusiasm for outdoor activities, propelling him into the mountains around the world as a keen walker, rock and ice climber. But it wasn’t until he was ­recuperating from a brain tumour in 2001 that he encountered the work of Muir, and grew to appreciate the ­restorative power of the Scot’s mantra. Ken said: “Although I obviously had many difficulties, the experience of the brain tumour ultimately proved to be a positive one. When I got out of the hospital, I had to learn how to walk and obviously I couldn’t climb either. “I was staggered when I came to realise I had lived my whole life mainly in Edinburgh, had been passionate about climbing and the outdoors, and yet I hadn’t heard of this guy. Enthused by the ­wilderness, Ken found a way to reconnect with nature, a passion represented in the photos of his trip. 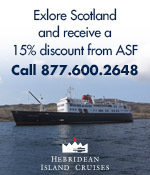 And in a bid to draw a connection between the American luminary and his Scottish heritage, Ken approached the American Scottish Foundation, co-organisers of the annual New York Tartan Week celebrations. The photographs became part of the program of events in the 2005 jamboree, being exhibited in Central Park’s Arsenal Gallery and twice since then, including during Muir’s centenary and again this year. Dad-of-two Ken, 59, said: “The outdoors played such an important part in my life and, after illness, getting back to that was very important to me. “It was looking at Muir, reading about what he had done, which ­rekindled my passion and ­determination to get back out there and do it. Photographer Ken Patterson : his photography exhibition In The Footsteps of John Muir opens in New York this month. Ken’s recovery affirmed a wider pondering on notions of Scottish identity, at home and abroad, and eventually led to him establishing a website, The Famous Scots Project, an ongoing study into the work of influential Scots. He said: “After illness I became ­philosophical. I started to look at life in a slightly different way. I decided that the strength of the nation lies in its sense of community, the heart in its people and the soul in its history. “Cicero said that not to know where you come from is to forever remain a child. Scotland needs to move on a wee bit and get a better sense of depth of its own history beyond Culloden and all that. In 1903, Muir guided president ­Theodore Roosevelt through Yosemite, camping out for three nights during which Muir lobbied by the campfire, impressing upon him the need to set aside key areas for preservation and appreciation by future generations. 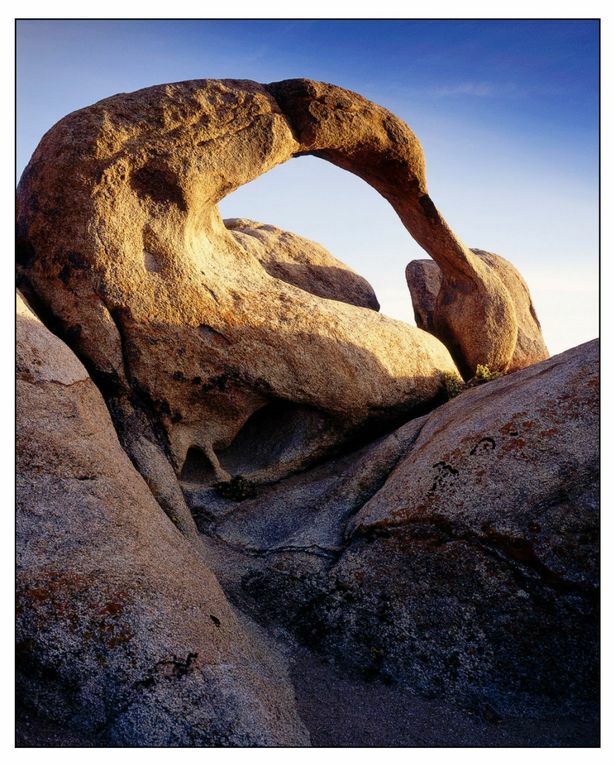 A natural rock arch in the Alabama Hills beside Lone Pine in the foothills of the Sierra Nevada, John Muir’s ‘Range of Light’ in California. It worked. Roosevelt instigated five national parks in office. There are now 58. Muir’s profile in Scotland has been bolstered in recent years, principally with the 2014 inception of the John Muir Way, a 130-mile east-west walk from Dunbar to Helensburgh, echoing a 211-mile trail named for the Scot through the American Sierra Nevada. Schoolchildren also take part in the John Muir Award, an environmental education scheme encouraging young people to forge an appreciation of nature. Ricky Ross weighed in on the legacy of the man described by ­Statesiders as a “wilderness prophet”, writing the tune For John Muir as a tribute on Deacon Blue’s 2014 album A New House. The Bristlecone Pine can live for 3000 years making it one of the longest living organisms on the planet. Situated on one side of the Owens valley in California the Inyo mountain range have several sites of bristlecone forests. Ken said: “All of America’s national park system came out of this determination by Roosevelt to preserve America’s wild places for future generations. This entry was posted in ASF Events, Initiatives and tagged American Scottish Foundation, Daily Record, Federal Hall, John Muir, Ken Patterson, NPS Centennial Celebration, Paul English on May 7, 2016 by Camilla Hellman.